A valuable sites for tourists and local advertisers. Asheville.com offers a lot of information like guides for visitors, and local news for regulars. During my time, everything was modified on the site using hand coded html and text editors, which made content management a little tricky and labor intensive. But it also taught me some extremely valuable lessons that I would have never learned using a modern day CMS. As content manager, my primary role was discover and create content, distill is down to bite sizes bits of information, then get it approved and published, 5x per day! I also did a good share of site maintenance, updates and ad management, with some emphasis on client relations. 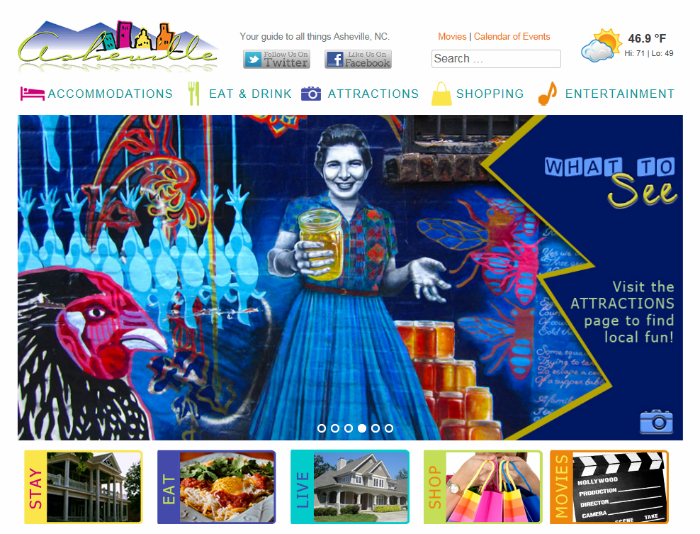 Visit the site @ Asheville.com.